Catriona McPherson is here today to talk about how she did on her 2016 reading challenge to celebrate the release of her latest in the Dandy Gilver series. Over the years, Catriona has been a frequent guest here on Mystery Playground from telling how to make Bloody Scottish drinks or telling stories out of school about secret beds. Don't forget to check out her giveaway at the end of the post. It’s lovely to be back at Mystery Playground. Thanks for having me. 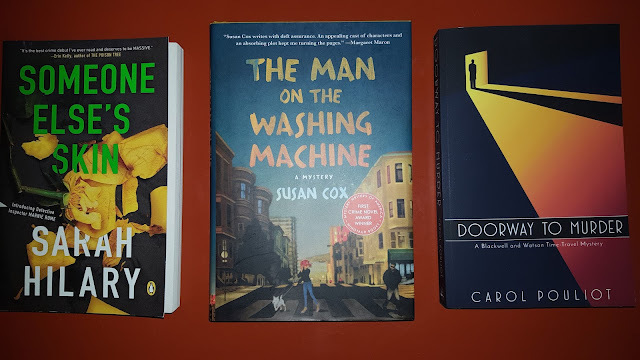 I think this is the first time I've swung from your monkey bars at this time of year , as we all say "Welp, there goes another one” so it seems fitting to take a look back at the year in books. Yolo County (yes, really) Libraries issue a reading challenge every year. I think it's for kids, judging by the fact that the books along the bottom include Black Beauty (never read it) and The Secret Garden (love it with a burning passion). But there’s no reason adults can't play along. Here’s my final-ish score card. 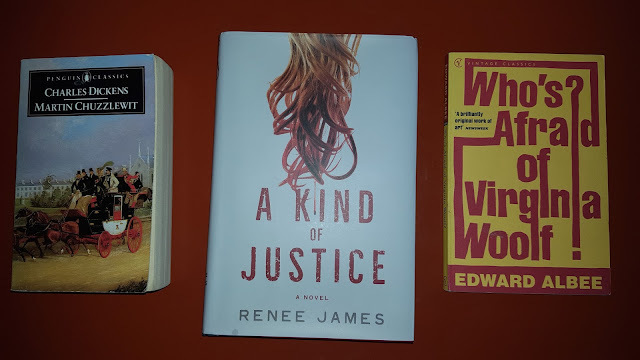 I read dozens of books published this year, but I've picked out A Kind of Justice by Renee James. It's the story of a transgender Chicago hairstylist, Bobbi Logan, who's in the frame for the murder of a transphobic attacker. It's set in 2008 and while Bobbi tries to stay out jail she's also trying to save her business and her home as the great recession begins to chew up everything in its path. It's a brilliant look at the recent past as well as a gripping tale and a heroine you want for your BFF from page 1. Who’s Afraid of Virginia Woolf is my finish in a day. In fact, I finished it in a bath. It was the most perfect reading experience of the year. I left the madness of the Harrogate Crimewriting Festival, drove to an idyllic B&B in the Yorkshire countryside, bought this gorgeous edition of Albee’s script in a gloriously disordered second-hand bookshop I passed on a long walk, and read it lying in a huge bubblebath, with a cup of tea and more shortbread than was strictly necessary. I’ve been meaning to read Dickens for three years now. It was my resolution last year and I blew it. This year I finally broke my Dickens’ duck, and did it deliberately with Martin Chuzzlewit. No one ever recommends poor old Chuzzles and I reckoned if I could get through one of his less stellar works, I could probably go on and read the lot. All I can say is if this is Dickens phoning it in, I give up in a huff. The Man on The Washing Machine by Sue Cox was recommended by my local bookseller if you'll let me argue that Don & Jen Longmuir of Scene of the Crime's books (Ontario) are local to me (California) because they’re at Malice and Left Coast and Bouchercon most years AND that they "recommended" it by putting it face up on the table. What I’m saying is that “Oooh, pretty” is a perfectly legitimate way to choose books and this is a great jacket. Another great jacket belongs to Doorway to Murder by Carol Pouliot and I'm claiming it as the book I should have read in school, because it's about time travel and, if I was the king of everything, time-travel would be real. I love it. Cannot resist a time-travel tale. That’s why even though I had promised myself I'd say no to all blurb requests before my head exploded, I couldn't resist this one. No fudging for the next item. Well, that’s not true. The book chosen for me by a spouse … BFF is Sarah Hilary’s Someone Elses's Skin and it was chosen for me by Erin Mitchell, the BFF of all mystery writers and readers when you get right down to it. I stand by my modifications. Excellent Women was published before I was born, by the excellent woman Barbara Pym. I'm reading it right now as I slog to the bitter end of the work in progress, because it’s a. not a mystery b. hilarious and c. as soothing as an afternoon in a hammock on an island. If you like Jane Austen for her waspishness rather than the bonnets, Pym might well be your afternoon in a hammock too. I got myself in a tangle trying to work out if reading an ARC and then being given the final book afterwards was reading a book I already owned or not. But in either case, Murder in G Major by Alexia Gordon is a good'un. It took me a while to fudge the category of book that intimidates me. I’m too much of a philistine to be intimidated instead of just bored by most intimidating boring books. But Martin Edwards' terrific The Golden Age fits the bill in the best possible way. 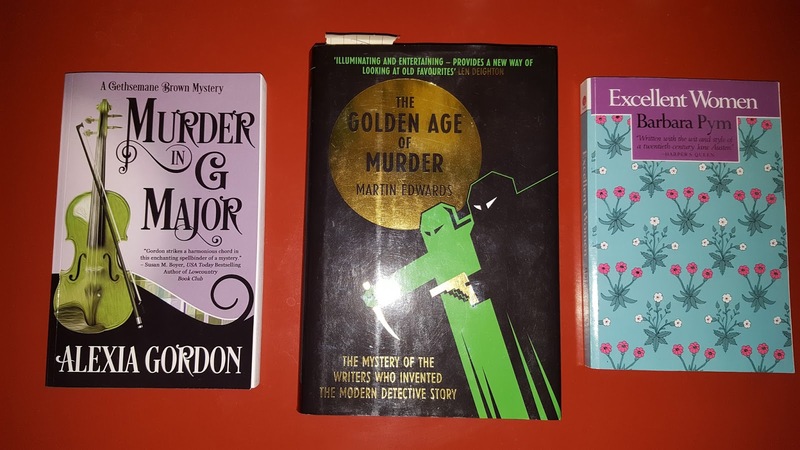 I can sit and make things up till the sun goes down, but Martin researched and assembled and checked and re-checked and then made readable decades of history about dozens of writers, their books and their lives. I take my hat off to him (and I recommend this as a present for any mystery fan). Two categories are a complete bust. I didn't read any banned books or any I'd previously abandoned. Ulysses could scoop both categories I started it today, because that’s a banned book I abandoned with, well, abandon once before. I considered it, but my philistinism rode to the rescue and I abandoned the plan. As for the final item on the checklist? I don't think I've read a book I’ve already read before, but this week I’m launching (in the US) a book I’ve already launched before (in the UK). The Reek of Red Herrings (Dandy Gilver No. 9) hits the bookshops tomorrow. Today is the last chance to take part in a pre-order gift and giveaway I’ve been running. If you order the book by midnight tonight, I will send you a free short story set in Dandy’s house at Christmas time and I’ll enter your name in a draw to receive a bundle of all eleven books in the series. Details are here. Happy Holidays and Happy Reading, everyone. 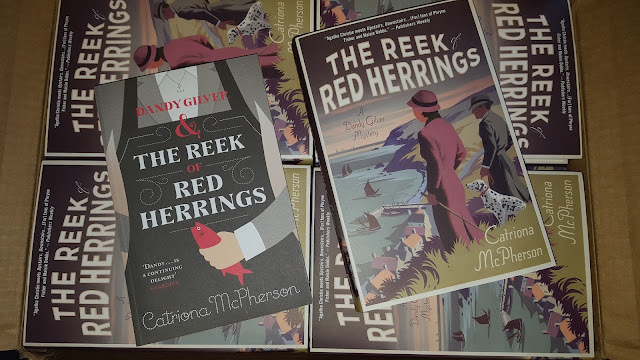 Come on back tomorrow to read our review of Catriona's new book, The Reek of the Red Herrings. Terrific ! Really enjoyed this. I'm a fan of reading challenges myself (this past year's was War and Peace a chapter a day (and I'm still on track)). Not sure what next year's is going to be, but this is inspiring me! What a fun post! Thanks for stopping by Catriona. Ive never read W&P but I'm saving it for after Dickens. Thank you for sharing your challenge. 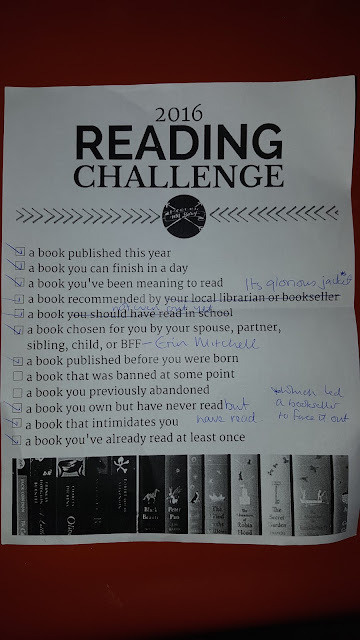 I'm something of a reading challenge addict, so it's fun to see what others choose. I loved Dickens' novel, "Dombey and Son." A total delight! What a great post Catriona! Thanks so much.